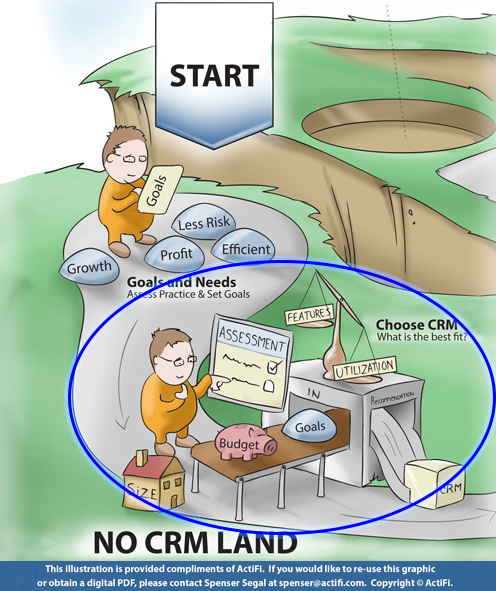 The Advisor's Journey to CRM Success, Pt. 3: Which CRM to Choose? Just like selecting the right vehicle for your transportation needs, your CRM choice can make for a challenging or pleasant ride. Following a thorough business readiness evaluation, it is time to begin the platform selection process. Platform specialization, budget and functionality (e.g., contact and activity management, templates, workflows and sales management) are a few of the considerations in this early part of the journey. With many good CRM options available on the market, sorting through the potential solutions requires a rigorous process and well-defined criteria. There are several high-quality CRMs that are focused on the wealth management space. Industry-specific solutions tend to be better bets since ongoing product development will benefit from a critical mass of like-minded customers requesting similar functionality, such as integration with financial planning and portfolio management softwar). The end result is a product with superior out-of-the-box functionality and integration with other software solutions within the wealth management industry. Next is the balance between budget and functionality. We break functionality into two categories, essential and advanced. Essential functions include: Contact Management, 360° Client Management, and Activity Management. Advanced functions include: Templates, Checklists, Workflows (Process Automation), Sales Management, and Mass Communication. First, determine what functionality you want in a CRM system today as well as anticipating your future needs for the next five years. Then sift through the options balancing functionality needs with budget to narrow down the options. At this stage of the journey, leveraging the knowledge and experience of others is the best thing you can do. Just like any trip, advice from those who have been there is irreplaceable. Get referrals, talk to independent third parties, read reviews and reports to get as much information as possible before making a final decision. Access free resources like the ActiFi CRM Software Key Insights Report. CRM vendors, custodians, broker-dealers and third-party implementation partners can be great resources as well. Successful implementations and happy customers are in their best interest, so most are willing to share a plethora of useful information with potential customers. Most of the industry-specific vendors do an excellent job of help prospective customers determine if their solution is a good fit for the advisor’s needs. Platform selection is a prime time to make sure there are key internal voices at the table. Ensuring that input from all parts of the organization that will use the system is gathered and considered will make the rest of the journey significantly more comfortable and productive for everyone. Leaders and project champions will set the tone internally for everyone else who is eventually touched by the project. If leadership and project champions are fully on board with the software selected, their behavior will be significantly more positive and drive much better results. Once you have selected your platform it is time to finalize preparations for your Journey to CRM Success. In my next post I will discuss the planning, data review and set-up required for success – a little like packing for a successful vacation. View the entire series, so far, of Spenser Segal on CRM Success.